Following a decade of research and development, Solta Medical recently introduced the powerful LipoSonix technology to the United States, where it has attracted widespread professional as well as high-profile media attention. Viewers of Dr. Oz and Barbara Walters ask for Solta Medical LipoSonix treatment by name. Rigorous exercise and healthy diets unfortunately leave some patients short of their body contouring goals. LipoSonix is a proven, non-surgical means to reduce stubborn, vestigial fat in the midsection. Solta Medical LipoSonix is driven by safe, high-intensity ultrasound technology. LipoSonix treatments have proven a viable means of providing a finishing aesthetic touch, without the need for invasive liposuction. Treatment sessions run an hour or less and do not harm the skin. Patients can lose up to an inch of waistline fat subsequent to a single one-hour session. During the weeks post-therapy, the body simply and naturally metabolizes the adipose tissue, rendering the typical female patient a dress or pant size smaller. SunrayLaser.com specializes in fine ultrasound and cosmetic laser machines, and can always offer an attractive price on the Solta Medical LipoSonix. Please contact us quickly for a great quote or answers to your questions regarding LipoSonix. 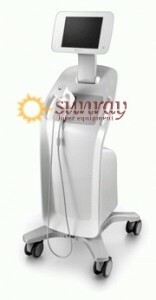 SunrayLaser.com has become a leading supplier of refurbished Solta Medical LipoSonix systems. We have built an unparalleled reputation in the professional market as the go-to source for clean, well-maintained, previously operated aesthetic medical devices. Solta Medical LipoSonix has received U.S. Food and Drug Administration clearance for the non-invasive reduction of waist circumference. Our dedicated technicians have meticulously revitalized each Solta Medical LipoSonix in our extensive medical laser inventory. Every unit we ship is guaranteed to perform to the manufacturer’s original equipment specifications. SunrayLaser representatives are always happy to discuss the excellent products from Solta Medical. Simply enter your contact information in the form below, and one of our experienced equipment consultants will be in touch shortly. Why wait? Get a price quote today!